Well, I am updating you on my dear project. My good friends Ariana, Ethan and my truly favorite Loraly. I am so excited about how the story is turning out. I am only to page 159, but i have an update. A dear friend read it and seeing how excited she was for me almost brought tears to my eyes. This has been a labor of love for me and a practice in patience for my dear Don. While he watches his college sports I sit with my wonderful pink laptop banging away on the keys. I am getting excited about how good it has been getting. Truly I never saw anything like this when I was told what I needed to be doing in my patriarchal blessing. It has been a great experience. I can hardly wait to say it is done and over with. But, not yet!!! I just love love love this season!!! I love unpacking the decorations and letting the house gain its colors that it doesn't normally have. Our tree this year is just a plain Christmas tree. I wanted to do something different, but since I decided to do all my Christmas shopping today...except for Don's presents. I sort of ran out of the money I needed to finish. I am thrilled that our decorations are finished now. Outside we have our share of wildlife creatures, deer, moose, polar bear and even a cute little penguin. The icicle lights are hung up on the roof thanks to my sweet husband who does anything to make me happy. On most days that is!!! I also decided to try something new and be as creative as you all out there. I tried this so I am thrilled that it turned out somewhat all right. I would love to hear your comments on it. i decided that my walls were too plain but I didn't want to put a nail in the wall and I jsut wanted to add something. So I figured a few ornaments on the wall with some ribbons. Gold seemed to be my theme color this year. Molly also got into the fun creating this special wreath with me. we bought the kit over at Michael's and after nearly 30 minutes of cutting out petals Molly was able to put this all together by herself. So, this is her creation. Aside from the cutting it was a very easy craft which is surprising!!! Well, let us know what you think!!!! Ok!!! So here is something that irks me. It is the Poncho People of the world. I am including a picture of my dear friends, Edward and Donna, whom we met over at California Adventure theme park just a few weeks ago. As we stood in line at the Grizzly Rapids Ride they pulled out ponchos for goodness sake!!!! I have always made fun of the Poncho People who ride the rides taking care not to get wet and that reminded me of life. Now, please understand I am not throwing a temper tantrum because that is how they chose to ride the ride. Don and i got completely an utterly soaked. we did not dry off until we made it home that night at nearly 2am if that gives you a clue. Anyway, What I was thinking is that there are so many of us out there who dream and dream big. I don't see anything wrong with dreaming. I like to dream. it always makes me feel good to do so. I dream of being a published author and I am working at it. Truly I am working at it. I think if this computer crashed with all 159 pages of what I have written already I would more than likely cry for days. I have noticed though that there are two types of people in the world. The Poncho People who protect themselves and don't reach out far to make their dreams come true being so cautious. then there are the dreamers who reach for it all in hopes of gaining their greatest dreams. Don's dream was to own his own store. He has reached out and grabbed it. yes, there was some divine intervention on that, but it has happened nonetheless. He is wonderful at also rooting me on for my dream. books are not his thing, but he is always supportive and understanding about my late night typing sessions. he understands that I have a lack of concentration when the words are flowing through my head. Is it easy for him to deal with. Not at all!!! He does though and for that i am grateful and always will be. So, if you are a Poncho Person out there then I pray that you are happy being who you are and live life to your fullest capacity. If you are a dreamer, then reach for what you want to be and if you don't make it then it was only because you didn't try!!!! Go dreamers!!!! No, I am not actually sprouting feathers and flying, but my heart feels like it. 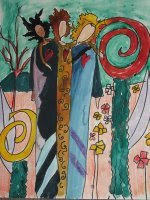 I have been writing and working on a book that has become like and entirely new life. I watch my characters like I watch my children. I have created them...in my mind though not my womb. I am letting them start to fly a bit and I think the hardest part about them flying is worrying about them crashing. I have allowed a friend and a great cheerleader read my latest draft of the 2/3 I have finished so far. I know there will be work to do with the re-writes, but I want to finally finish before I go back and rewrite it all again. Anyway, I waited for days wondering just what was thought of the story, the characters who have become so close I hear them talking. I worried what they would think about my creativity. When I finally received an e-mail I didn't want to open it because quite honestly, who wants to hear their baby criticized?! My heart completely and totally soared when I heard the review. Yes, I do know that it is not ready for publishing quite yet, but after finishing the story and polishing it, it will be and I will be thrilled with it. That is when the craziness comes. The heartbreaking waiting for letters from publishers turning you down in hopes for just one that will say yes. Someday perhaps it will be there, but until then I will let my dreams soar. Most of you all know that Don & I have our store. The day after Thanksgiving is usually the one where Don tradiationally runs around in the morning hours of us being opened saying: "Where is everyone?" Due to the fact that people are normally running back and forth to the big box stores because they offer the best deals, but yesterday we were pleasantly surprised that so many people came in and bought small things here and there. The small things add up and we had a great day. Some came to just look, some came prepared to buy, but all in all we are feeling blessed by Heavenly Father. I know I am feeling terribly blessed. I hope you all had good shopping experiences!!!! To be honest, my favorite part of today is usually the part where I take a nap after the turkey. My niece destroyed that thinking we needed activities. I love her dearly, but the thought of running around right after eating our huge thanksgiving feast with all the trimmings just did not sound all that wonderful. She put together...and well might I add...our family's version of the amazing race. There were challenges, roadblocks and detours. Some were incredibly horrible like finding certain words in a huge search a word puzzle then unscrambling what was left to target shooting with BB guns. I was teamed up with the master mind's twin and I felt bad for my niece. not only did she get stuck paired up with an aunt who could not run up a hill without wanting to fake a heart attack just so I could sit down, but i had a very tough time trying to shoot a target that was just 2 inches in diameter and shaped like a turkey. needless to say for the first leg of the race we came in a disappointing 3rd. For the second leg we took off and thanks to both of us working as a team and her incredible skills of taking shortcuts through the garage we manage to end up snagging 1st place honors and the first cuts of our favorite pies for dessert. all in all, even though I ran most of my food off in the hour long set of tasks we had a great Thanksgiving with many reason for thanks...like not having a heart attack!!! I watched Molly tonight out in the center of the stage performing tonight and I listened to one of the things that her teacher mentioned and I took a bit of thought into it. She said that actors are truly shy on the outside but when playing a part can blossom into something incredible on stage because they don't have to be themselves. As drama geek to the core I agree completely. At this point in my life I am working very hard on a story that has brewed in my mind and hopefully developing a talent that heavenly Father has blessed me with. i am grateful to my cheerleaders...you know who you are. On several occasions I find myself lost in my own thoughts not paying attention to the outside world. I am quite content to watch the outgoing women in our ward talk and enjoy themselves and quite honestly I am not very good in the social aspect of my life. I am a geek to the core and I truly mean that. Those who are as oddball as I am understand. I truly do not feel at ease in most people's presence because I am so insecure with myself. I am overweight, not a beauty queen and taller than most amazon women. Quite honestly, I am a freak or have often felt like that. I never remember my age and can't remember dates to save my life. No I do not forget my immediate family's birthdays or my anniversary but ask me anything that revolves around a date and I am a babbling fool. I have been working a lot lately on my writing and I am thankful that in my own little world i can change from one person to another. I can be the evil queen or the simple girl trying to cope with her past. I let myself fall so deeply into the stories that I often hear conversations in the back of my head that belong to the characters. Many times it can be in the worst times. I have found myself sitting up until 2am typing away because they will not be quiet. Luckily, my husband understands the drive that I have to get this going. I am over half way through the novel and I pray that the end comes along and that i am inspired as how to reach the goal of finishing it before I start collecting social security. We shall see, but it looks like I will be finishing up more than likely next year in hopes of trying to get it out to some publishers. We shall see, but I just figured I had better explain before you got caught up in a conversation with me and my eyes glaze over and i completely lose track of what I was even talking about. that's when my dear friends/characters are talking to me. Please forgive me if you see this happen to me. i promise to snap out of it. besides, one a social reject always a social reject. I am taking a break from the cleaning and laundry that has become my Monday ritual and took a look at some of you girl's blogs. Can I just totally say how much I love your inspiration. I have plenty of old things around here that I want to change around into new things. I watch how you change an object just by a little paint and just tweak it a bit here and there. How wonderful you all are. I have a few ideas, but we shall see how they all go. I rarely have time to myself to think it all through. I have also discovered that I truly want to declutter my home as well. Perhaps changing a few things around may work...We shall see what happens. I'll take some pictures if I ever get things going!!! Well, I am happy to announce that we have a new member to our family!!!! No, I am not pregnant either!!!! I have managed to buy my first brand new car ever. Now, I know Don had gotten the truck, but we had priorities with that. He needed a good truck to haul around the feed and such. I was extremely grateful for that. I was also grateful for the my little plum colored car, the Goofmobile" as we called it...which by the way they didn't give me much for the trade in. I of course was not surprised at that one. Just by turning it on they realized the transmission was on its way out and that it would start to overheat on a dime. Along with the other myriad of problems. I was so excited because one thing after another fell into place for us. The financing turned out great, they gave me an even lower rate, they quoted me the bare bones clearance 2007 model price for a 2008 fully loaded and then stuck by their offer, they are covering the car for the lifetime of the vehicle aside from tires, brakes, wipers, the paint job and windshield...if it breaks down ...they fix it and I do not get charged a penny. That includes free towing and a rental car, plus if we are traveling they will reimburse us up to $1000 for hotel and food costs associted with waiting for the car. So I am incredibly happy with my new 2008 Jeep Grand Cherokee. It is my dream car and I am thrilled. It truly could not have gone any better. Oh...and yes, they are transferring my favorite license plates "Goofmobl" to the new car. Can life get any better?!?!? Oh and no...Don is not allowed to drive it!!! It's my car!!!! yay!! just kidding. I think I will let him take a spin tonight in it around the block....maybe. F-R-I-E-N-D-S forever...I'll be there foryou!!! If any of you have heard the full extent of this night please forgive me, but truly it was one of the craziest our lives. It started out simple enough. Dinner with friends to celebrate our 15th anniversary. I am now incredibly sorry that until last week I did not have a digital camera to record the evening because truly it was like living an episode of FRIENDS. Don thought it would be fun to rent a limo for the night to take us to San Francisco...as we are together 24/7 we have absolutely nothing to talk about other than the store and the kids so we figured it would be fun to invite another couple to take out for the night. Figuring after all the craziness in their lives up until that point we figured Lora and Anson could really use a night out to not think of the bad stuff and concentrate on the good stuff. Well, that ended up being the best night we have had in a long time. Our limo arrived nice and prompt complete with red carpet and balloons for us to celebrate our night. We also had champagne which was a laugh considering I explained to the company several days prior that none of us drink. So they were going to replace with sparkling cider. Oh well, we survived. our trip got underway and we were having a good time. Lora began making strange little faces until she could not stand it any longer. She HAD to take off the boots as they had not stretched out enough for her to wear fully yet. So we sat back and enjoyed the night talking while Lora began to play with the lights. might i add that somehow we were booked into the prom limo that actually had fireworks bursting with different colors as we pushed the buttons. As if that hadn't been enough we arrived to the fabulous restaurant Palio D'Asti on Sacramento street. When we arrived we all climbed out with the exception of Lora. Bless her heart the poor girls could not get her boots back on. After a few minutes. She managed and joined us walking into the restaurant. Now, i must add that my dear BFF Lora did not happen to feel her best as she came down with a cold so concentrating on something was just not gonna happen at this point. We were shown immediately to our table where we quickly sat. The waiter came over and introduced himself...not that I remember his name now and rattled off a list that made us all look at him strangely. he talked so fast we heard: "blah blah blah cod blah blah blah sea bass blah blah blah pasta..." and you get the picture from there. Poor Lora had the deer in the headlights look that was enough to make me laugh. bless her heart she looked at him and explained that she had no idea just what he had said...i doubt the rest of us understood either. Finally after nearly 15 minutes of painful ordering we managed to come up with a menu for the night. Now, also Lora had this thing for clean forks. She actually requested at one point for our waiter to bring her five forks....so...What did he do? he brought her five different forks. It was incredibly funny. the maitre d walked past several times staring at the forks. We later explained that the waiter was doing exactly as ordered by Lora so that he would not get in trouble. The maitre d looked at the forks and then rushed off only to come back with the only fork that the waiter had forgotten. Of course, who could have forgotten our dear businessmen traveling form somewhere in Asia enjoying our basic dump trucks. We watched trying desperately not to laugh as they each took turns pretending they were the dump trucks lifting the dumpsters off the ground. Poor Lora and Don were looking out the window and were unable to turn around as that would make it too obvious that we were laughing at them. The evening was capped off with Lora enjoying sitting at the controls, down her window pretending to be on the cell phone and of course our dancing in the limo to some 80's music. So i must say although i felt trapped in an episode of friends...It was the most incredible night that i will never forget as long as I live. Well, until next year when Lora plans the itinerary...i think it involves a limo and target, perhaps even baskin robbins. I am not sure but I quite scared....Pray for my strength!!! Well all...it has happened again. I have received my third letter telling me what a horrible writer I am. Only problem is...I don't believe it yet. Oh well, I guess they will have to try and break another girl's heart because as with everything I am a work in progress. my writing abilities are progressing as my dear friend Lynne has helped me. My creativity has been flowing...too which I am eternally grateful to my Heavenly Father. I honestly do like getting the turn down letters and I will tell you why. You are going to think me just a bit more insane than normal, but with every single turn down letter I get...this one was actually signed. I read one little bit of the letter that makes me smile. "Dear Author" are the words that truly make me smile. I always think of myself as a writer. Author is the title that you earn when your story is published. In my heart, I am a writer...I am not an author...yet. Believe me...when that glorious day comes when someone truly goes insane and accepts one of my manuscripts I will be screaming it from the top of the Altamont....the Sierras are too far away and quite honestly I don't have enough energy to climb Mount Everest to scream it from there. So, in honor of my latest rejection I hold a glass aloft and send a toast to all those striving to live their dreams, whatever they may be, through what seems to be impossible circumstances. 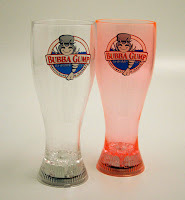 To you I raise my tall pink Bubba Gump glass to celebrate the wonderful people that you are and all of your amazing abilities!!! Cheers to you all!!!! I truly was just wandering around the web this morning hitting different blogs of people I had never met when my heart just ached because these women were so passionate and so creative I wanted so much to be like them....of course there was one major difference....I can't sew. Well, i really should qualify that...i don't sew well. I pieced together a quilt for Girl's Camp and it will do it's purpose of keeping me warm, but we shall see just how far that takes me. I am going to attempt to do the same for my daughters...make them a cute quilt with bright colored fabric for their beds. We shall see, but we will need to start after this weekend. Anyway, after seeing these outwardly creative women I dearly wished I was like them being very artsy with my hands and then it struck me....I AM!!!! well in my own little world. I am working on writing my latest story which in the end has had me literally creating my own world. Scary but true. It has been a challenge which I am desperately trying to rise to the occasion. Luckily...my hubby is behind me 100%. He understands when the voices in my head won't stop and i am sitting next to him in bed while he is sleeping I am typing away on my laptop. he understands it is m dream to finish and see a story published....we shall see how long that takes me, but in the end I ant something that I don't have to hate in the end. It is an interesting process I have fallen in love with...even though it tries my nerves to the end. So i finally figured out that on the outside I am not as creative as these fabulous women, but in my mind where the creative juices are flowing we are one in the same. Amazing how that happens! i know...I know. It has been declared that I am boring. Oh how heartbreaking ti was to get that news. Actually, I think it slipped out because I got tired of planning every night with the kids and him and I was tired. i wanted someone else to come up with something to do. I am truly tired of making every single decision. Why are men like that...sorry if any of you are reading this...but I assume you will blame it all on PMS and move on so we will leave it at that...So, I have been on strike waiting to see just what would happen. Here are the details....you all will get a laugh at this. We stopped by one of our favorite restaurants (old fashioned and haunted to boot..love it)..the Banta Inn... they got a very simple menu but I love the food. Anyway, we hit there at a particularly busy night and somehow ended up eating in the corner next to the jukebox nearer the bar than we would really like. The owner is a friend so we just let it go and he tried so hard to take care of us it was not even funny. The entire night turned into a comedy of errors. The cook...there was only one tonight was making everyones food and we had just been seated after a rush of people had come in so we had to wait in line. he was using every inch of the stove...anyway, i sat with my back to the jukebox with started blaring out some Kid Rock song that by the end of Molly started singing along with the chorus. the bonus is that we watched an entire episode of CSI on their tv's before our meal had even got there. The very best part was that Don was not able to complain because he set it up. I didn't complain at all and of course our friend Dave comped us part of the meal because we had to wait so long. By the time we got our dinner and left it was near the kids' bedtime so we had to go stop by the grocery store on the way home before Sunday hit. his planning of the night was a complete and total disaster. Not that I am gloating or anything, but there truly could not have been a more boring evening...And I am the one that is boring. Oh and I am not kidding about it being haunted...there are several ghosts that truly do haunt the place. If you want details I can give them to you later!! Lately, we have noticed just how slow it has been. We hear from other business owners that they are slower than usual. I can totally identify as our numbers from last year and this year have dropped. It is across the board. I've also noticed through prayers small miracles happening here and there. A man was waiting outside the store wanting a pair of boots. Boots is one of our specialties so if you are looking for cowboy boots come on down we can find something for you!! Sorry, shameless plugs and all it is my life. Anyway, He was waiting and I sold him a pair of alligator boots. Can I just say now that this does not happen very often. The normal cost of these boots is $900 and no I am not joking...however they can go much higher. Don woke up late and had not even made it to the store quite yet. he showed up as my new best friend left with his precious boots. Don asked causally if I had sold him some boots and I responded just as casual that I sold them. If he would have anything in his mouth he would have choked...we do not sell them all that often. Anyway, little miracles here and there to boost our business. I believe it is because we got rid of the alcohol and cigarettes that Don's Dad used to sell there. I am so thankful and today it seemed like the people were not going to stop coming in. I find myself after work saying the phrase "Thank you Heavenly Father!" Do you see small miracles in your life that make you say the same?